Standard EM2000 devices do not have a wireless add-on connector (a.k.a. "SPI port") and the "landing" PCB area for the connector is left empty (cross-section A). Compatible wireless add-on modules (such as the WA2000 Wi-Fi module) can optionally be soldered into the connector pads (cross-section B). Option "-A" EM2000 devices feature a 10-pin wireless add-on header (cross-section C). The pins on this header are identical to all other pins of the EM2000 and face the host PCB. This way the wireless add-on port of the EM2000 can be connected to some other circuitry on the host PCB. For example, instead of mounting onto the EM2000, the WA2000 add-on can be mounted directly onto the host PCB. 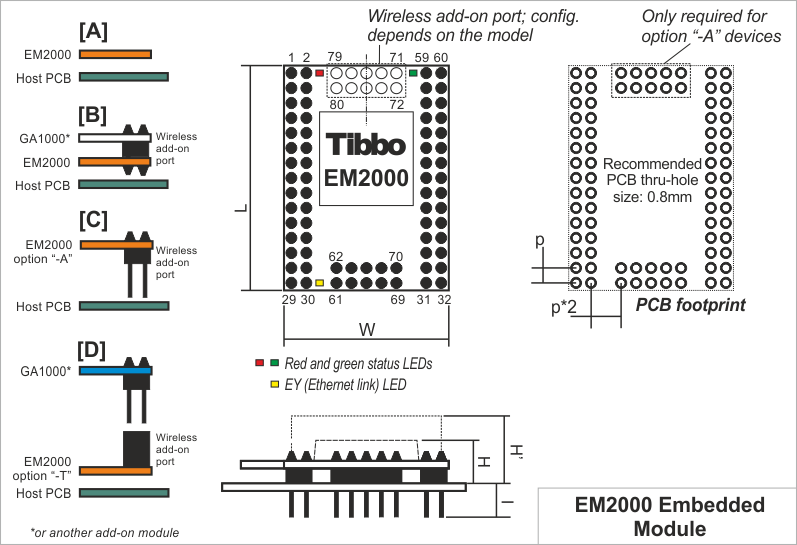 Option "-A" EM2000 module is then required to facilitate the connection between the EM2000 and the wireless add-on. Finally, option "-T" devices have a female wireless add-on port connector, which the WA2000 can be plugged into. EM2000 modules of "-T" variety (cross-section D) are intended for convenient testing of wireless modules and are not recommended for use in production devices.